www.ascpskincare.com 43 expertadvice BUSINESS BASICS Are You Ready? 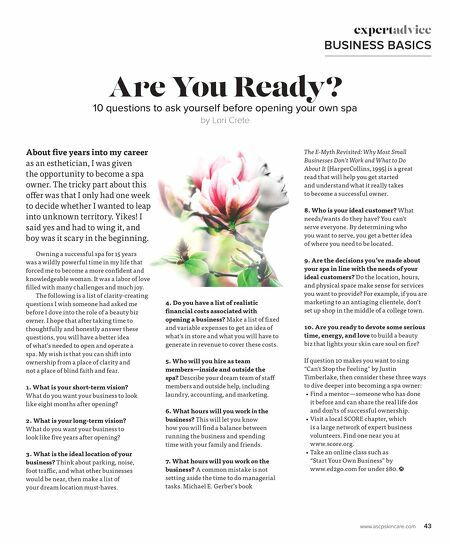 10 questions to ask yourself before opening your own spa by Lori Crete About five years into my career as an esthetician, I was given the opportunity to become a spa owner. The tricky part about this offer was that I only had one week to decide whether I wanted to leap into unknown territory. Yikes! I said yes and had to wing it, and boy was it scary in the beginning. Owning a successful spa for 15 years was a wildly powerful time in my life that forced me to become a more confi dent and knowledgeable woman. It was a labor of love fi lled with many challenges and much joy. The following is a list of clarity-creating questions I wish someone had asked me before I dove into the role of a beauty biz owner. I hope that after taking time to thoughtfully and honestly answer these questions, you will have a better idea of what's needed to open and operate a spa. My wish is that you can shift into ownership from a place of clarity and not a place of blind faith and fear. 1. What is your short-term vision? What do you want your business to look like eight months after opening? 2. What is your long-term vision? What do you want your business to look like fi ve years after opening? 3. What is the ideal location of your business? Think about parking, noise, foot traffi c, and what other businesses would be near, then make a list of your dream location must-haves. 4. Do you have a list of realistic fi nancial costs associated with opening a business? Make a list of fi xed and variable expenses to get an idea of what's in store and what you will have to generate in revenue to cover these costs. 5. Who will you hire as team members—inside and outside the spa? Describe your dream team of staff members and outside help, including laundry, accounting, and marketing. 6. What hours will you work in the business? 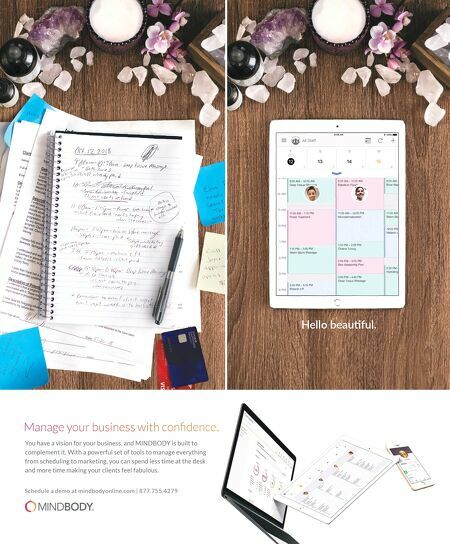 This will let you know how you will fi nd a balance between running the business and spending time with your family and friends. 7. What hours will you work on the business? A common mistake is not setting aside the time to do managerial tasks. Michael E. Gerber's book The E-Myth Revisited: Why Most Small Businesses Don't Work and What to Do About It (HarperCollins, 1995) is a great read that will help you get started and understand what it really takes to become a successful owner. 8. Who is your ideal customer? What needs/wants do they have? You can't serve everyone. By determining who you want to serve, you get a better idea of where you need to be located. 9. Are the decisions you've made about your spa in line with the needs of your ideal customers? Do the location, hours, and physical space make sense for services you want to provide? For example, if you are marketing to an antiaging clientele, don't set up shop in the middle of a college town. 10. Are you ready to devote some serious time, energy, and love to build a beauty biz that lights your skin care soul on fi re? If question 10 makes you want to sing "Can't Stop the Feeling" by Justin Timberlake, then consider these three ways to dive deeper into becoming a spa owner: • Find a mentor—someone who has done it before and can share the real life dos and don'ts of successful ownership. • Visit a local SCORE chapter, which is a large network of expert business volunteers. Find one near you at www.score.org. • Take an online class such as "Start Your Own Business" by www.ed2go.com for under $80.